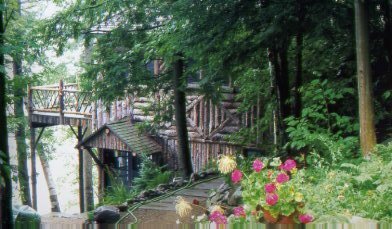 O-Kwa-Ri-Ga is a beautifully renovated Adirondack camp on eight lakeside acres sitting on the Fulton Chain’s pristine 7th Lake. Three buildings comprise the camp. The Main House has over 3,850 sq. 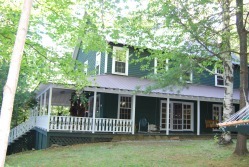 ft., seven bedrooms, many wonderful sitting areas, and a 150' wrap-around covered porch. The Main House can comfortably sleep 12 people. Just down the hill from the main house is the 3-bay Boat House with a 1,200 sq. ft. game room and large south-facing sun deck.Also available is The Cabin that was featured in Ralph Kylloe’s book Cabins and Camps. The Cabin is fantastic in its architecture as well as luxury. The 2,600 sq. ft. Cabin has two full baths and can comfortably sleep 6 people. In the summer season, the entire camp is rented together, but at other times of the year, the Main House and Boat House may be rented separately from the Cabin. This camp offers a taste of the old Adirondacks with thoroughly modern comforts. The 110 year-old camp, known as O-Kwa-Ri-Ga, has been a boy’s camp and an old hunting lodge. During the 1980's and 1990s, it was thoroughly renovated with all the conveniences of modern life while not losing an ounce of its old Adirondack charm! 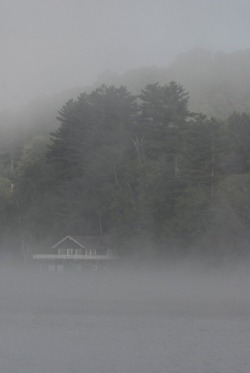 O-Kwa-Ri-Ga has not just the beauty and serenity of the Adirondacks , but also all the fun of a great lakefront vacation! 7th Lake is great for all sorts of water sports and there is no place to enjoy them more than from Boat House and the 300’ of lakefront decks and docks. Rental of the Main Lodge includes a canoe, and sunfish sailboat and rental of the cabin includes a kayak. Old Forge and Inlet also offer some of the best winter sports activities including snowmobiling, skiing, and ice skating, all within a few miles of the camp.